In Guerneville we are located about a block west and across the street from Safeway on the Main Street of town. From San Francisco take Highway 101 north to Santa Rosa. Just north of Santa Rosa take the River Road (Hwy 116) exit. At the bottom of the exit, turn left and proceed about 18 miles to Guerneville. From the north take Highway 101 south toward Santa Rosa. Just past the town of Windsor take the River Road (Hwy 116) exit. At the bottom of the exit, turn right and proceed about 18 miles to Guerneville. For a scenic route either from the north or the south use Highway 1. Once you reach the town of Jenner take River Road (Hwy 116) to Guerneville. It is a beautiful drive along the Pacific Coast but do allow for extra travel time. From the east (Sacramento) take Interstate 80 to Vallejo, then take Highway 37 to Highway 101 north and continue north to Santa Rosa. Just north of Santa Rosa take the River Road (Hwy 116) exit. At the bottom of the exit, turn left and proceed about 18 miles to Guerneville. 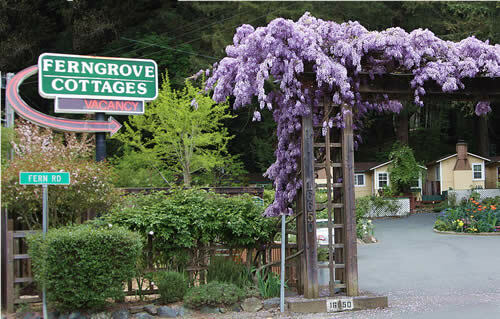 Daily direct flights from Seattle, Portland, Las Vegas and Los Angeles to Sonoma County / Santa Rosa airport, only a 20 minute drive from Fern Grove Cottages. San Francisco and Oakland airports are about a 2 hour drive. during the night. Winter temperatures are typically in the 60’s during the daytime. » Check this week’s weather.